Last time in Categories of Weight Training Part 1, I made a quick introduction to the series and talked about metabolic/depletion type training. I won’t sum any of it up here, just click the link. In that article, I also listed the three primary types of training I wanted to talk about and listed the second type as “hypertrophy training” which is what I am going to talk about for the next several parts of the series. Today, in an effort to confuse everyone including myself, I’m going to re-categorize that one initially as “growth training”, then babble about a bunch of underlying physiology that nobody cares about and then go right back to calling it hypertrophy training. Of course, the explicit goal of this type of training is building bigger muscles although there can be a variety of reasons most wish to achieve this goal. One would be to provide a base for increased strength or power performance since larger muscles are potentially stronger muscle. Athletes, depending on the specifics of their sport, might wish to actively increase muscle mass to increase their potential performance capacities. Arguably the biggest goal of this type of training is simply aesthetics. Whether the goal is explicitly bodybuilding or one of the other physique sports (fitness or figure), looking good naked, or what have you, it’s usually true that most seek out increased muscle size out of some sort of aesthetic type of goal. In recent years, there has been quite some interest in muscle loss with aging and methods that help older people to maintain or build new muscle mass may go a long way towards preventing health problems and falls in later life. But before I get into the details, now would be a good time to cover the different “types” of growth that can occur. This is the section that will hopefully make you understand why I went through the verbal gymnastics up above in redefining the title of this section of the series as “growth” training rather than “hypertrophy” training. Hypertrophy refers to an overall increase in the actual size of the skeletal muscle mass; that is the actual muscle cells/fibers grow larger In contrast, hyperplasia refers to a situation where there is an actual increase in the number of muscle cells (or fibers) that exist. That is, rather than the existing cells/fibers growing larger, the body actually makes new fibers that can then grow larger. In that vein a very early study of bodybuilders found that top bodybuilders had more fibers than control subjects; as there was little evidence to support hyperplasia it was argued that folks are born with more muscle fibers might have more potential for growth. If this is unclear, an easier example might be that of increases in body fat which can also occur through either hypertrophy (existing fat cells grow larger) or hyperplasia (the body makes new fat cells which can then fill up with triglyceride and grow bigger via hypertrophy). Now, the topic of skeletal muscle mass hyperplasia and whether or not it occurs in humans in response to training has been one of great debate for a couple of decades at this point. Some early animal research, some of which was similar to weight training (e.g. in one study they trained a cat to paw against a resisted lever to get food) and some of which wasn’t (bird models where the wing was placed on stretch for 30 straight days), suggested that hyperplasia could and did in fact occur. I’d note that determining this with any degree of accuracy is exceedingly tedious. First you train one side of animal (or one limb) but not the other. Then you kill it, dissect it and count the muscle fibers (and we’re talking thousands) by hand under a microscope, comparing the number of fibers in the trained to the untrained muscle to see if there’s a difference. There is a built-in assumption that the animal had the same number of fibers in both sides to begin with and on and on it goes. Obviously you can’t readily do this in humans. The best you can do there is take a muscle biopsy (a small chunk of muscle) and count the fibers in one muscle versus another (or before and after training). But this is like taking a slice through a car and trying to make conclusions about it’s overall structure so the results can be misleading at best. In any case, it’s been a long standing area of debate as to whether or not hyperplasia actually occurs in humans (a separate question might be: even if it does how much of a role does it really play in the response to training?). Up until recently almost no data suggested that this occurred; one or two odd recent studies that I can’t manage to Pubmed right now (which if I recall had the added confound of steroid use) suggest that hyperplasia may actually occur in humans (I think it was in the traps of powerlifters). Even there, the majority of the change in muscle size is due to actual hypertrophy and I really think that’s the key point here. At this point in the game, whether or not hyperplasia occurs is still up to debate in my mind. It’s one of those things that is going to be brutally hard to demonstrate in humans for methodological reasons. It would be odd that that singular pathway, found in most animal models, doesn’t exist at all in humans. I’d note that there has been a lot of interest in satellite cell activation through training and whether or not that is or is not quite the same thing as hyperplasia but I can’t claim to be up on that research so I won’t comment further. That is, even if hyperplasia occurs, it would appear to be of fairly minimal significance in the overall growth response (most studies finding that hypertrophy alone can explain the growth obeserved) and I don’t see any point in focusing on it to any great degree with specific types of training (although I am aware some are trying to do just that). And having explained that there are two types of potential muscle “growth” but that hypertrophy is the dominant mechanism behind increased muscle size, I’m now going to go back to just referring to “hypertophy training” for the rest of this series. Moving only to hypertrophy from here on out, the next issue I want to discuss is one that is another area of some debate. 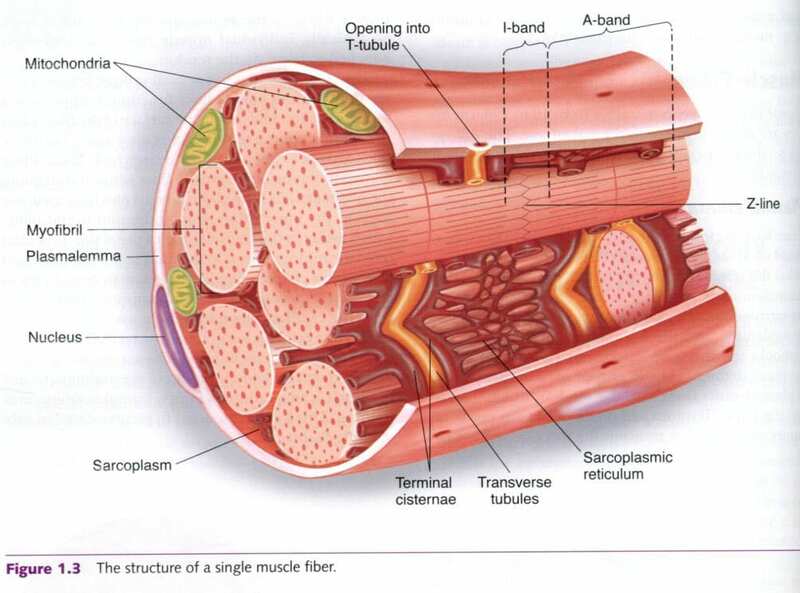 Very simplistically speaking, you can think of muscle mass as being made up of the actual skeletal muscle myofibrils (basically the fibers that actually generate force) and “everything else” including water, glycogen, minerals, connective tissues, etc. This latter part of muscle, or at least part of it, is called the sarcoplasm. Here’s a cross-section of muscle to show what I’m talking about. For years, a distinction between myofibrillar growth (growth of the actual contractile fibers) and sarcoplasmic growth (increases in storage of glycogen, water, etc.) which doesn’t really contribute to overall performance (but still makes muscles look bigger). Some also refer to this as functional hypertrophy vs. non-functional hypertrophy. In this schema, performance oriented athletes generally want to focus on functional hypertrophy; that is, actual increases in the size of the myofibrils. Because simply being bigger (without performing any better) is of little use to them. That is to say, for athletes, focusing on sarcoplasmic/non-functional growth isn’t usually of much relevance; it might make them look bigger but won’t make them perform any better since glycogen and water don’t generate force. Mind you, since both types of growth contribute to overall size so for physique oriented athletes, especially bodybuilders, working on both to at least some degree may be relevant to maximize overall muscular size. It’s still somewhat debatable how much the above concepts really exist or apply in the real world. Some research in the early 80’s suggested that this separation exists but those results may have been colored by steroid use (some steroids are known to impact things like glycogen storage and body water levels). 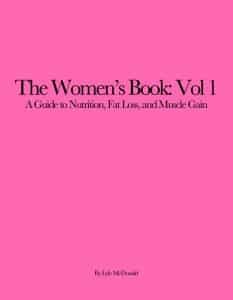 European sources such as Supertraining by Mel Siff and Yuri Verkoshansky as well as Science and Practice of Strength Training by Vladimir Zatsiorsky speak of the concepts as if they are proven. Other folks, such as Bryan Haycock, who’s opinion I think highly of, think the distinction is a load of crap. Personally, I tend to think that there’s some merit to the concept/distinction and I’ll leave it at that. There do appear to be some visual differences between athletes who train exclusively in lower repetitions ranges and those who just pump up all day with high repetitions (again, pure physique athletes tend to benefit from BOTH types of training). As well, some have found that pump type trainers tend to shrink more quickly (suggesting that the growth is of a more transient type) than those that train heavily. Or I could be hallucinating again. Before moving on, I want to make it clear that I am in no way suggesting that any type of training will generate one adaptation to the exclusion or the other. Clearly bodybuilders who do nothing but pump all day build some real muscle tissue (in this vein a recent study showed that training at even a low 30% of 1 repetition maximum stimulated protein synthesis), guys who do lots of heavier work build some sarcoplasmic volume. It’s simply that different types of training may build one or the other somewhat preferentially. Again, keep in mind that all training is on a continuum, you can’t readily say “this is one type of training” and “this is another”. It’s just a continuum of adaptations as you move through the different loading parameters where you’re getting a primary or preferential adaptation. Ok, moving on. Years ago I asked a smart-assed supervisor of mine “What makes muscle grow?” and he replied “Sunlight and lots of water.” Ah, if it were only that easy. Debates (both scientific and empirical) over the actual stimulus for muscle growth have raged on for decades now with some simply asserting “We have no idea what stimulates growth.” Which is usually used as a lame-assed copout to justify some idiotic style of training. And even if the statement that “we have no idea, blah, blah” were true years ago, it’s really not anymore. Clinical research continues to uncover the mechanisms underlying both the acute and chronic responses to resistance training that result in long-term skeletal muscle growth (hint: Google mTOR, AKT, and a whole bunch of other labcoat stuff if you get bored) along with determining what aspects of training stimulate those different pathways. And it actually turns out that there are a few different variables that seem to impact on one or more aspects of the growth equation. As one recent review paper put it, simply we can look at the stimulus for muscle growth as falling into three distinct (but likely overlapping) categories: progressive tension overload, muscle damage and metabolic stress (I’d note in a moment of smugness that I included those three factors in my first book The Ketogenic Diet, written back in 1996). Each of which may play some sort of role in the overall growth stimulating processes. I’ve commonly referred to growth as being related to primarily tension (load on the bar, roughly) or fatigue (metabolic issues related to the length of the set and the rest intervals taken between sets) but damage (due to the eccentric/lowering portion of the movement) also appears to be involved. Progressive tension overload is arguably the one that I tend to put the most focus on since I tend to be of the opinion that it’s the primary stimulus for growth (other factors being secondary); as a generality, once you take anabolic steroids out of the picture, the muscularly largest athletes tend to be the strongest as well. Perhaps more accurately, athletes who make the best strength gains in a moderate repetition range (as Dante Trudell once phrased it) combined with sufficient food tend to grow the best. This means that, over time, weight needs to be added to the bar to continue stimulating growth. How often, how much, etc. is a topic for another day and I’m not saying that this is an every workout kind of thing. But if this year you’re benching 225X5 and next year you’re benching 225X5, you’re not going to be any bigger. If you’ve increased from 225X5 to 275X5 over that time span, you probably will be: Progressive tension overload is the name of the game here. It’s interesting to note that the idea that mechanical work was the key stimulus for growth isn’t even a new one, back in the 70’s a classic paper by Goldspink argued for that very thing. Which is a big part of why I find the assertion “We have no idea what stimulates growth” to be so absurd; we’ve had 90% of the picture since the mid 70’s (with most of the recent work being mostly molecular level wanking). Anyhow. The idea that muscle damage plays a role in growth has been around for years with a variety of different effects being offered. It’s also arguably been why a focus on being sore from training is often sought. Addressing that in detail would also take another article and there are a lot of good reasons to not worry that much about soreness since it rarely correlates much with the actual growth response. Consider, for example: people who train a muscle group infrequently usually get very sore but often grow poorly while people who train more frequently get less sore but grow better. Or consider that soreness is usually the highest early in a training cycle whereas growth is usually highest at the end of the training cycle. Clearly soreness per se is no indicator of growth and I think chasing soreness/DOMS is a mistake. Sufficed to say that, outside of untrained folks (where just about anything causes damage until something called the repeated bout effect kicks in), muscle damage tends to occur most readily in response to the eccentric (lowering) part of weight training. In this vein, many studies have shown that a combination of concentric + eccentric work generates better growth than pure concentric work (some studies show that if you do enough volume of pure concentric work you can get the same growth response as with combined concentric/eccentric work; I still think combined concentric/eccentric work is more effective/efficient). Finally there is the issue of metabolic stress and/or fatigue with various local metabolite (e.g. calcium, maybe lactate) accumulation possibly being related to the growth stimulus. And there may be others; for example hypoxia (a lack of sufficient oxygen) has often been argued as part of the growth stimulus and bodybuilders have used various types of continuous tension non-lock training to try to achieve this. Ultimately, the three stimuli discussed above, progressive tension overload, metabolic stress (fatigue), and muscle damage seem to be the primary factors at this point in stimulating muscle hypertrophy. And I think if you look at most successful training programs (i.e. the ones that work for most trainees), they invariably have some combination of all three of these. And as molecular studies continue to determine more of the actual mechanistic stimuli for hypertrophy (it’s a letter jumble including things like mTOR, AKT and others), it’s looking like these different aspects of training may be activating different molecular level pathways in the overall growth response. I’d mention here that one aspect of growth that I didn’t talk about was the acute hormonal response to training. While much has been made of this over the years, recent research, as I outlined in Casein Hydrolysate and Anabolic Hormones and Growth – Research Review, suggest that they have little impact on the overall growth response. Other studies suggest that the issue is still unresolved. It’s worth mentioning a recent study in rugby players which found that the individual strength training protocol which generated the highest testosterone response for a given individual also led to the greatest strength gains for that individual. In contrast, they made very poor strength gains when given a strength training protocol which caused no increase in testosterone levels. Whether or not that indicates that the hormonal response is causing the strength gains is debatable but the topic may be unresolved. And that’s where I’m going to end it today (yes, I realize this was all background babbling) since it’s already running long. In Part 3, I’ll continue with the topic of hypertrophy training and look at things like loading parameters (intensity, frequency, volumes), exercise selection and other stuff just as I did in Categories of Weight Training Part 1 for metabolic/depletion work.